The Gunners recovered from going down to a Marko Arnautovic strike, to win 3-1 at the Emirates Stadium on Saturday. Nacho Monreal equalized before the break, before an Issa Diop own goal and Danny Welbeck wrapped up Emery’s first win in the Premier League. “We needed to win today and to show our supporters the three points. It’s clear we need to improve and to not concede many chances like today. “In the second half we found better balance because we spoke in the dressing room,” the Spaniard told Sky Sports after the game. 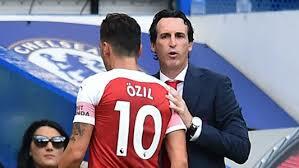 Reacting to reports that he had a fight with Mesut Ozil, who did not play in the game, Emery said: “Why is this information? It isn’t true. I don’t know who started this. He was sick yesterday and we decided for him not to play today.